In the first days of school, we don’t know each other. The incoming sixth graders wonder who I am, as their teacher. I’m trying to get a handle on them, my new students. Sometimes, things come together unexpectedly in ways that sets the tone for the year. A week and a half ago, when our school year started, Hurricane Harvey and the deluge of Houston was underway (and now it’s Irma bearing down on Florida). It is difficult not to want to reach out somehow and help when natural disasters happen. On the first day of school, I asked my homeroom class if they wanted to try do a school-wide event to help the families of Houston, somehow. It was unanimous. Yes. After some brainstorming of ideas, they voted as a class to host a Sports Day (with the start of the NFL season, it seemed nicely in tune with the season) and to ask our school community for donations for Houston’s recovery efforts. 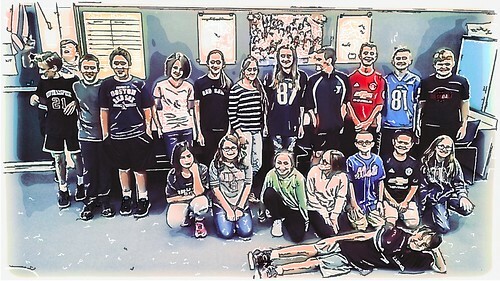 Yesterday, we raised more than $900 with our Sports Day event, with my sixth graders doing most of the announcement work to the school community throughout the week. They went on school television each morning. They hung posters. They chatted it up with friends and other students. Still, $900 is a lot for our Western Massachusetts school community. Clearly, we tapped a desire by others to help, too. There were bags of quarters, a dollar coin, crumpled bills stuffed into envelopes, staff members wandering in all day with donations to add, and even a surprising check from a family to the cause. The American Red Cross was an obvious choice for where our donations could go, but I was more interested in finding a smaller, more focused connection. I wanted to find a school, preferably an elementary school like ours, that could use some help from the outside world, from another school. I wanted my students’ altruism to have a more immediate impact. I did some searching and kept my eye on Twitter, and sure enough, I found a reference to the Bear Creek Elementary School in Houston, where the librarian had put out a public call for assistance and she has organized a Wish List on Amazon for cleaning materials, school supplies and more. Last night, I got in touch via email with the Bear Creek Elementary School folks (Hi Anna) and learned more of the story there. The school is still closed. They will set up temporary operations in a high school. Families are in desperate need of help. They just met with families and students for the first time since the storm. Emotions and loss are running high. It’s been a very difficult time for all. They are grateful for help. I know my new students feel proud of what they accomplished, and now, I hope to have them choose items off the Wish List that might help the Bear Creek folks. We’re working on the logistics of that part of things. Maybe something more durable will come of this, too. Maybe our school and Bear Creek could make a real connection. And to top of off, we started the year off on a positive, productive note, looking to the greater world through the lens of compassion. Now that is a learning experience. Congratulations to you and your students for raising $800 to help the school in Houston. Doing the research to find a local school in need of help was a great idea. It will be interesting to see how your relationships with this school grow. Hopefully this will last for many years and when your students are seniors, or out of school and working, they will still be connected to families who may be still rebuilding their lives.